It’s entirely possible that when Jeff Bezos checks his Flash Briefing on his Amazon Echo this morning, one of the first things it will tell him is that he is now the richest man in the world. Amazon’s shares skyrocketed in overnight trading, with shares opening at about $1,066, up about $16 (1.5%) from their close on Wednesday, July 26, ahead of the company’s quarterly earnings report expected this evening. 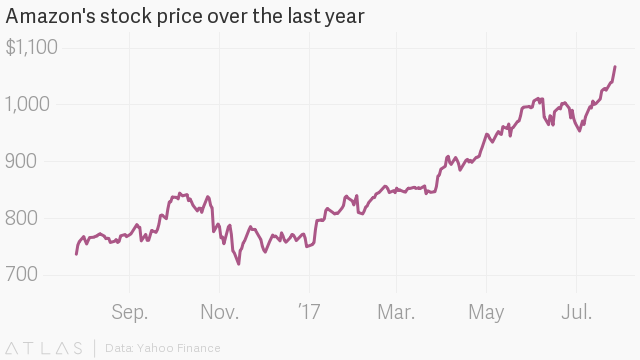 That price bump was enough to send Bezos over the top to surpass Bill Gates, founder of Microsoft, as the world’s richest person. Bezos owns over 80 million shares of Amazon, according to recent filings with the US Securities and Exchange Commission, which after today’s hike, are worth over $86 billion. Bezos’ net worth, beyond just his shares in Amazon, when you take into consideration his stake in the Washington Post and Blue Origin (his space company), and his other assets, it’s enough to top Gates, according to CNBC.